CSS-based theme support. 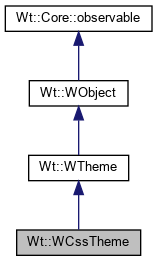 This implements the classic Wt themes, which were available before theme support was customized with the addition of the WTheme class. The following table shows which style classes are applied by this theme. * CSS selectors for these widgets are currently still hard-coded in the widget itself. Creates a classic Wt theme. Wt comes with two CSS themes: "polished" and default. For the bootstrap theme, use WBootstrapTheme. The CSS class Wt-selected is applied to active classes. The CSS class Wt-disabled is applied to disabled classes. Returns wt.css, plus on IE wt_ie.css, plus on IE6 wt_ie6.css. The style sheets are located in the theme directory in the resources folder.